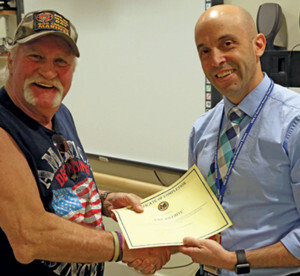 Ray, a Vietnam veteran, graduates from Non-PTSD class with a VA Behavioral Health provider. The Non-Combat PTSD Program began at VASNHS in March and is a 16-week course, which provides both group-oriented therapy sessions and individual therapy for veterans suffering the effects of post-traumatic stress disorder from a wide range of traumatic activities not related to combat. “The program, as run here, is unique to this facility and the classes and manuals were developed locally,” said Steven Fisher, a VASNHS clinical social worker who manages the program. According to Fisher, the new program covers seven specific skills to address trauma symptoms, including stress, sleep, intrusive thoughts, negative thinking patterns, problem-solving, anger, and communication. While the group portion of the program is critical, veterans also have the opportunity for personal counseling via individual therapy sessions. Therapeutic processing of the traumatic events occurs in individual therapy when warranted, using evidence-based treatment. Veteran participants do not share their trauma stories in the group. That setting is reserved strictly for skills development. Fisher says that this formula has yielded positive results. “I’ve seen a greater ability to talk openly about the traumatic events, to handle previously upsetting situations with increased calm, to manage the stress response through daily relaxation practices, and to manage negative thinking through increased awareness and understanding,” he said.